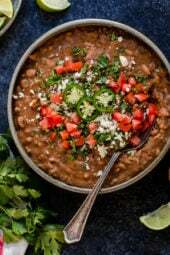 I’ve taken some of my favorite recipes and converted them for the slow cooker. 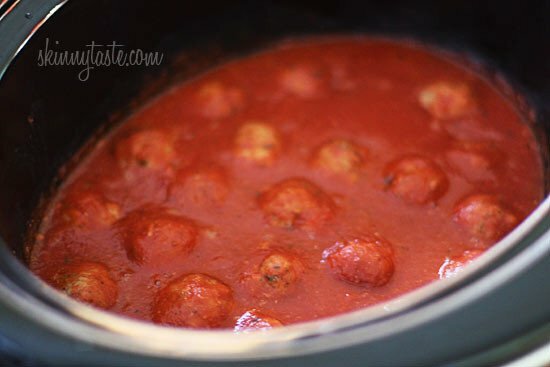 You can see my stove top version of this recipe here Skinny Italian Turkey Meatballs. One thing I should mention when making this for the slow cooker, it’s best to carefully form the meatballs with gentle hands, if you pack them tight they will get tough while cooking. If you prefer to bake them in the oven first, bake them for 15 minutes at 350°F. 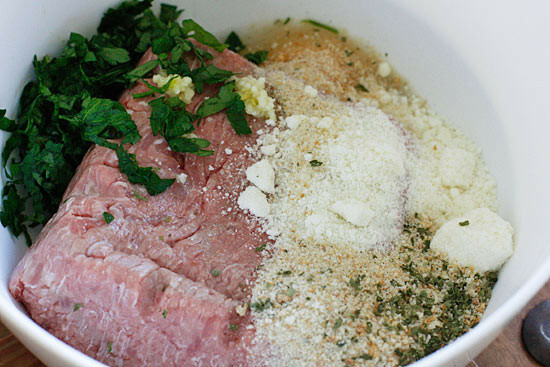 Then add to the crock pot for 2 – 3 hours on low. If you want more sauce, add another can of crushed tomatoes. In the fridge until I’m ready to cook them? Do you plan to modify this for the instant pot? Wow! Made this in the instant pot – 7 minutes and it was perfect. Just delicious!! Hi! Do you knowthe point value if it’s 99% fat free? Cooked these for 4.5 hours in my crockpot (I omitted the cheese) and they came out AMAZING. Hats off, Gina! I have these in my crockpot now. I have 2 questions. Was the one can of sauce enough? Don’t want them to over cook which leads me to next questions how many hours did you all do? How should I alter amounts if I use 2 lbs of ground turkey? Made this for a crowd at a family dinner and it was a huge success; everyone loved it !! My husband just asked for this recipe for its birthday 🙂 i add chopped onion and fresh basil to the sauce and its just fantastic. Can you tell us how much protein? This was incredible! I made a few modifications:1). I purchased “roasted garlic” crushed tomatoes for even more flavor.2). I added red pepper flakes and an extra bay leaf to the sauce, in addition to a ton of chopped basil (added before serving).3). We served this over Zoodles and garnished with additional parsley and grated cheese. Delightful!4). I only used 1 lb of ground turkey and I think the extra ratio of turkey to breadcrumbs/egg/cheese made the meatballs extra juicy. Excellent!! Soft and perfect! Tastes like it’s from a restaurant! As always- delicious! I doubled the recipe for my 6 quart slow cooker and it was perfect! Plenty of leftovers for my family of 5 plus some extras to freeze for later. Easy meatballs to assemble. Mine were delicious- not too dense, delicious flavor. The sauce was perfect as well. Served ours over zoodles with a little ricotta. YUM! These were so good! I made them with 1/2 lb of ground chicken and 1/2 lb lean ground chuck. I also used 28 oz of tomato sauce instead of crushed tomatoes. I didn’t have any problems with them staying together, and the sauce is something I will use for other recipes that call for marinara. The little bit of oil in the ground chuck added flavor and depth to the sauce. I used them for my weekly meal prep and the extras for meatball subs for dinner one night. You couldn’t tell they were healthy. Do the meatball have to be in a single layer to cook properly? My daughter’s christening is next week and was considering making these for about 35 people so was going to double the recipe since we’ll have other food as well, but just want to make sure if they would cook right if some are on top. They just need to be covered in sauce, but if I were doubling, I might broil them first so they hold their shape. How many points would the meatballs be without the sauce? Thank you!! Oh my! I loved this and it’s definitely a keeper recipe for me with the modifications I made and will probably continue to make! I used 16 oz of Italian seasoned 93% lean turkey and add 1/4 cup onions and 1 cup mushrooms both finely chopped. Used less salt as the breadcrumbs were also Italian seasoned ones. Added dried basil and oregano and a splash of red wine to the sauce. Cooked the meatballs in the oven about 20 minutes before adding to the sauce which had been simmering stovetop for 30 minutes or so and continued simmering for another 30 minutes or so. Tender and delicious! Oh and I did omit the cheese. I got 16 meatballs. 1 and 1/2 ounces each.I’m having fun with my new food scale. I counted 5 points for a 4 meatball serving with a generous portion of sauce. Has anyone made it with 99% fat free turkey? Do you have plans to turn this into an instant pot recipe? Love this, just got an instant pot, and I’m looking for ideas! I know I’m late to the game here but…just made this last night for my meat-loving husband and he was obsessed! Kept raving about the flavor and asked me to make them again ASAP. Thanks for the recipe! Could you make this with 93% lean ground beef as well? Did you try it that way? Has anyone ever made these with ground bison, you think would it change the timing? Pingback: Round-Up of our Go-To Weeknight Dinners! How much protein and fat? I got 99% lean turkey by mistake… I’ve always made this recipe with 93% and LOOOVE it… do you think the meatballs would get too dry using 99%? Thanks! Just made it… And it turned out great, both meatballs and sauce. In absence of parsley i used the green from some green onions. And for the sauce I sautéed in addition to the garlic, some scallions and the white from the green onions. It turned out delicious especially with basil, i will definitely do it again. I frozen a batch of raw meatballs for the next round, i didn’t feel like putting two layers of meatballs in the crockpot at once . Easy receipe, will put it in my receipe chest. I made this in the crock pot last night. The meatballs were moist and tender although not as flavorful as I had hoped. The sauce was incredibly disappointing. It looked nothing like the picture. It was thin (watery) and not a vibrant red. It seemed kind of like it was marbled with the fat/drippings from the turkey. I did use 93% lean ground turkey, but even that has a lot of fat that can be drained when cooked on the stovetop. I will not be making this again. I made mine stovetop and the sauce was fantastic. I did add some basil and oregano and a splash of red wine and didn’t drain the meatballs which I had baked in the oven. Yum! The meatball ingredients list 1 teaspoon kosher salt + fresh pepper. Is this 1 teaspoon of each? Or 1 teaspoon total mixed together? Also the directions do not list the S&P as a step to add to the meat mixture. Should it be added at all? I make a lot of your recipes for me and my husband! Thanks Gina!! It should be fresh pepper to taste, add with the other dry ingredients. My gravy after the first hour got a little cloudy… maybe the meatballs disintegrated a little? Is this ok? Has this happened to anyone? Pingback: Sunday Funday with a side of meatballs! – Real Food. Real You. Can you use the instant pot with this recipe? If so, do you need to modify anything? Thanks! Sure, just less cook time. Enjoy! How long would you recommend in the instant pot ? I am very interested in making these but I would like to make them without the sauce. I know it might sound odd but I want to have them with the bolognese sauce that you have on the site. Can I bake these in the oven without sauce and maybe throw them in teh crockpot for the last house that the sauce is cooking to finish them off? If so, how long should I bake these? Why isn’t your skinny italian turkey meatball recipe available anymore? These were absolutely to die for. Both kids (15 and 5-year old boys) asked if they could have leftovers in their school lunch. It's not often that they clean their plates. 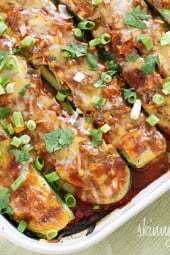 The kids had theirs with pasta and we had our with zoodles; really a fantastic recipe. I wish I had leftovers for myself! I substituted coconut flower for the breadcrumbs to make this gluten free. Hope it turns out well. WW is changing their point system and now requires saturated fat numbers in order to calculate point values. What is the saturated fat number for this dish? Great recipe one strange thing though: when I add it into recipe builder in ww it comes out to be 7 points+ for 6 servings with sauce ingredients included. These were delicious! I baked them for 15 minutes first then added to the crockpot and they turned out perfect. Served over zoodles for me and added mashed potatoes for the hubby who wanted something more substantial than just zucchini with them. They were even better the next day for lunch at work! Great recipe. In my opinion, meatballs are a truly personal food – they are often connected to so many family memories. I used Panko instead of breadcrumbs and ground chicken instead of turkey and they are delicious! They will definitely be on my clean eating menu rotation. Not sure what I did wrong but my meatballs fell apart during cooking. On the positive side my husband thought it was the best meat sauce I've made and wants me to make it like that again instead of your Crock Pot Bolognese Sauce which I had been using. Great recipe. If I wanted to use double the meat, would I double all the ingredients? Also does the time then change also? These meatballs were so good! My fiance (still getting used to that word!) was skeptical (even though everything we've tried from your site has been amazing), but they came out even better than I had hoped! The meat flavors the sauce so well, and the consistency of the meat was perfect. I froze a third and we refrigerated a third (we try to cook for the week on Sunday); I am hoping they will turn out right when we re-heat them. We did ours for four and a half hours. Thank you Gina! Hi Michelle! 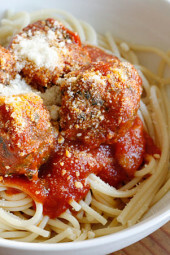 How did your frozen meatballs turn out once you reheated them? Also, did you freeze before cooking or after? Thank you!! This (and in a saucepan on the stove) is the ONLY way my mother, and now I, ever make meatballs. I hate frying them – they get hard on the outside but stay mushy inside. Baking them gives them a weird shape and texture and the fat leaks out and then sticks to the meatball in clumps – SO gross. But making them and then dropping them directly into hot sauce is the way to go. They come out so much better, and the meat flavors the sauce as they cook! 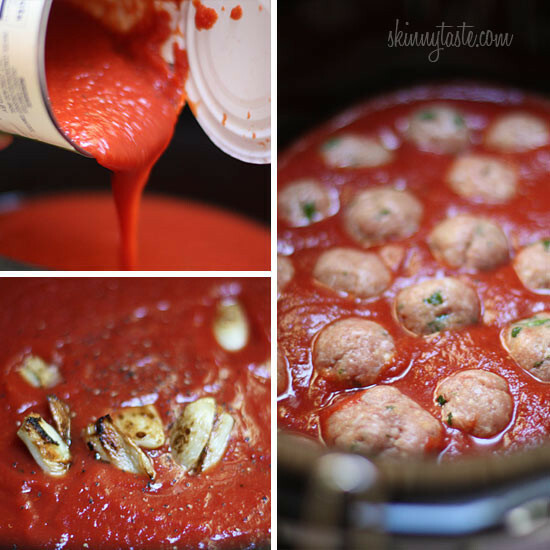 I love this recipie and it has become a staple in my household but when the meatballs are done cooking on low for 6 hours I do notice there seems to be some sort of white film that looks like "cooked cagulated blood" it forms a ring around each individual meatball. I have also made your asain meatballs in the oven and the same thing forms at the bottom of each meatball. Any suggestions on how to solve this? I tried these last night and they are great. We are gone all day so I put the crock pot on low for 11 hours and they were perfect. In the recipe, it says 28oz cans crushed tomatoes. Is it suppose to be two or is it just a typo. I swear these meatballs used to have zucchini in them…. Am I delusional or was the recipe changed? I used to loved that I could sneak zucchini into my meatballs! Alanna-I just made these two days ago. This recipe called for whole wheat breadcrumbs, which I didn't have but I wanted to get a punch of whole grain in my meatballs so I took whole oats and ground them up in my food processor to make oat flour. I did 1/2 italian breadcrumbs and 1/2 oat flour. I bet you could use only oat flour, which is GF. I'm no expert, but I don't think just increasing Parm cheese would work because it doesn't bind the meat together in the same way as breadcrumbs/oats. Hope this helps! 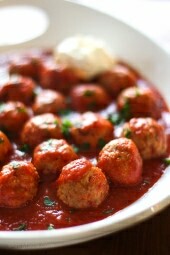 I love the idea of turkey meatballs! I'm trying to cut down on red meat. I was wondering if you ever skipped the breadcrumbs for this recipe? Would they still turn out alright without the breadcrumbs? I'm have an intolerance to gluten so I need to avoid bread. If I increased the Parmesan cheese maybe? Thanks! Am i the only one whole has very sticky turkey meatballs? I don't know if it's the kind of turkey i use but i end up having to add a bit more breadcrumb and cheese, and even then it's still very sticky. I can't really even roll them i just kind of form them. Anyways i got them to fit in the crockpot all at once although it's a very tight fit. I started late so i have them cooking on high for 3-4 hours. Hope that works out! I made these once before in a skillet and they came out fantastic! I've made these meatballs several times now, and they always turn out absolutely amazing. I've never tried them in the crock pot, I just cook them in a pan with a tad bit of grapeseedgrape seed oil. I usually triple the recipe when I make it so I have them all week to take for lunch at work. Amazing recipe, thank you for sharing it! These were fantastic, I used an icecream scoop for form the balls so that I didn't need to pack the meat densely at all. Fantastic. I did prebake them for 15 minutes and cooked for 3 hrs on low as directly. They were cooked, juicy and tender! YUM! So just one can of crushed tomatoes in this revised version? bomb dot com! super win on this recipe. I made the meatballs the night before and refrigerated them overnight. Dropped them in the slow-cooker with sauce for 5 hours the next day while at work and the family loved it! Thank you for another winner. I made these overnight and while the meatballs themselves came out great, my Rival non-programmable crockpot burnt the sauce even on warm. Just ordered the slow cooker you recommended which should arrive on Monday. I will be making this again in the new crockpot and can't wait to taste the difference! I have used this recipe multiple times and my family LOVES it. Will it work just as well with 99% lean turkey breast? Gina, I love your recipes. I saw your comment regarding the brand of crock pot. I have a Rival, 6 qt. and I don't like the texture of meats I cook in them. Do you think switching to another brand might improve the texture? I've read some poor reviews on Amazon on the Rival brand, folks say it is too hot, even on low. Thanks for your help. I just made these and they are fantastic! The turkey meat is a little dense, but I did precook them in the oven. Next time I will precook for less time or not at all. Great recipe! Is it possible to make the meatballs without egg? They look good but there is an egg allergy in the group. I just made this the other night. 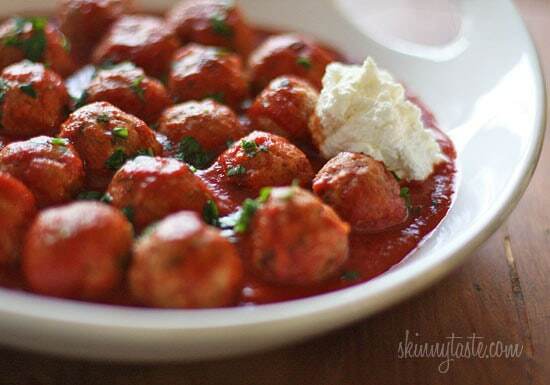 How do you keep your meatballs from getting so heavy and dense? The flavor was good, but the turkey was not the same as the beef. Any tips? Being an Italian married to a non-beef eater, I've been resigned to a turkey lifestyle for years. I used to be bitter about it, but now I don't even miss it. That being said, these were awesome! I served on crusty italian bread and topped with fresh parmesan. My nine year old ate two. Score! Here's a tip from my mom: When forming meatballs, run your hands under running water for a just a second. 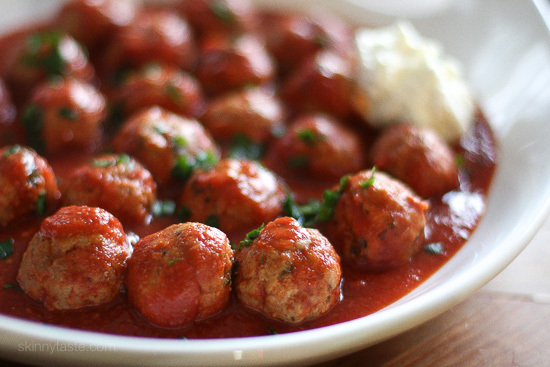 The water left over will help keep your meatballs together. Being vegetarian if i were to use veg. Sausage(soya)cut into balls, will they be cooked same way, as meatballs. Being vegetarian if I were to use "veg. sausage" cut into balls, will they cook the same way as meatballs? Can I make the meatballs without the cheese? I did and they were great! I just subbed in bread crumbs. I made these tonight and they were very good. But, I found the sauce went bland in the crockpot. I've made the stove top version before and it was amazing. Any advice on how to keep it from getting bland in the crockpot? surprising my husband with this tonight! he loves meatballs so i hope it turns out delicious! I don't know why I was skeptical…these were delicious! I was worried because I've never cooked ground meat in the crock pot before. I had to let these cook longer than suggested because I wasn't home and my crock pot isn't fancy and they were still so yummy! Another winner of a recipe! Everything, and I've tried a lot of your recipes, have been absolutely amazing! Thank you!! This is really good! I'm gluten free… so I just grate a piece of gf bread and use in place of the breadcrumbs. A winner for the entire family. Thank you. I made these for dinner tonight and they were delicious! I hollowed out some French bread rolls, put the meatballs and sauce on with some mozzarella cheese. Then put them in the oven to melt the cheese and crisp up the bread a bit. Will definitely be making these again!! Hi Gina, I made your escarole soup today (YUM! ), so I doubled the meatball recipe and froze 1/2 the turkey meatballs while I was at it. How long would you recommend cooking them in the crock pot from frozen? Thanks! They were done from frozen in six hours on low. Very moist! Very delicious! I like the idea of making a whole bunch one Sunday and having them throughout the month. What a great idea! I’ve always cooked them first, then froze. Hmmmm…. I'm making these as I type. Question: your serving size says 4 meatballs and 6 servings total. That would be 24 meatballs. I used a 1/8 measuring cup and mine only made 15 meatballs 🙁 I prepared using 20 oz of ground turkey. Is 1/8 cup just an approximation? Btw, I've made these before and they are delicious! One of my many favorites from your website. Thank you so much for your fantastic, creative, and healthy recipes! They be less than 2 tbs each? Every time I have made meatball recipes I have always had to use 1 Tbsp and that isn’t an actual Tablespoon, it’s the measuring one. That’s just from my experience. I make this recipe at least once a month with the addition of a finely chopped onion and a cup of sliced button mushrooms. Leftovers freeze well for later in the month.